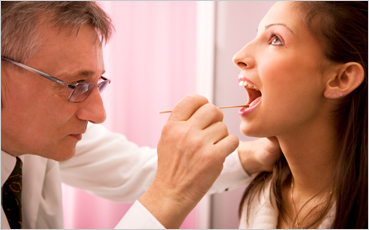 Ear, nose and throat disorders can cause severe disruption to everyday life, and sometimes signal serious conditions. Our doctors are specialists in treating disorders related to the ear, nose and throat (ENT) to keep you hearing and breathing freely. Our physicians provide the latest treatment for sinus disease, snoring, sleep disorders, voice problems, tonsillitis, nose bleeds, breathing conditions, sore throats, dizziness, vertigo, difficulty swallowing, ear ringing, hearing and airway obstruction. We routinely use state-of-the-art equipment to conduct hearing tests and evaluations, as well as detect cancers. If surgery is needed, our doctors can often operate on-site to correct problems in the head and neck that affect the thyroid, sinuses, nose, mouth and throat. For other conditions, patients are referred to Bellevue Hospital. To schedule an appointment with our Ear, Nose, and Throat Department call 212-238-7897.